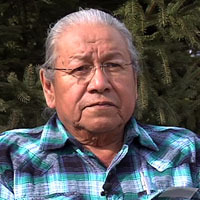 Robert Four Star is the Traditional Chief of the Red Bottom Band of Assiniboine people. Mr. Four Star has been a college instructor at Fort Peck Community College since 1984. In addition to instructing formal classes in Native American Studies, Contemporary Issues, and Oral Tradition, Mr. Four Star teaches the Assiniboine language and the song of the Assiniboine people. Assiniboine Bands - Robert Four Star. Assiniboine Gender Roles - Robert Four Star.